In my previous posts I gave an overview of Lucene Facets and showed how to write a simple faceted search program. This time I go through some of the internals of the facets module, in particular the structure of the taxonomy and search index as well as how faceted search is performed. The job of the taxonomy is to map hierarchical categories to ordinals (integers), and provide taxonomy browsing services. The taxonomy is managed through a sidecar Lucene index through DirectoryTaxonomyWriter and DirectoryTaxonomyReader. Often, I refer to the taxonomy as the "taxonomy index". You can then use the taxonomy to retrieve the ordinal of Date/2012 (and vice versa), its child categories (Date/2012/March) as well as its siblings (categories at the same level in the tree; none in this example). Parents: parents[i] denotes the parent of category ordinal i. 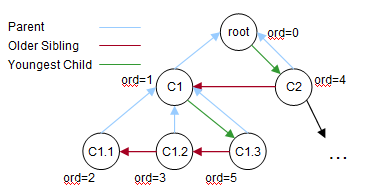 Note that all root categories (e.g. Author, Date and so forth), often called "dimensions", are put under a virtual root which always has the ordinal 0. Therefore parents=-1 (always), and for any i≠0, parents[i]≠-1. Also, parents[i]=0 for all root categories. Children: children[i] denotes the ordinal of the youngest child of category ordinal i. The youngest child is defined as the one that was added last to the taxonomy (and has a larger ordinal than all its siblings). children[i]=-1 for all leaf nodes. Siblings: siblings[i] denotes an ordinal j, such that j<i and parents[i]=parents[j] (i.e. the two categories are children of the same parent). j denotes the category ordinal that was the former "youngest child" of the parent ordinal. siblings is always -1, and the first child of a parent will always have siblings[i]=-1. The following diagram gives a visual representation of the information above. Note how the parents, children and siblings structures allow easy and efficient traversal of the taxonomy tree, as well as updating when new categories are added. When categories are added to a document, they are added as drill-down terms to the search index. In addition, their ordinals are encoded in a special term's payload (called the "fulltree posting"). For example, if you add the category Date/2012/March/20 to a document, then four drill-down terms are added, one for each level, e.g. 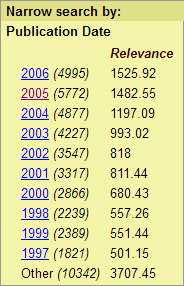 $facets:Date, $facets:Date/2012 and so forth. Additionally, all four category ordinals are encoded in the fulltree posting's payload, and are used during faceted search to aggregate the respective categories. Now that we understand the role of the taxonomy index and the data structures it provides for traversing the taxonomy, as well as the structure of the facets in the search index, we can now look at how faceted search is executed. As mentioned in my previous post, every faceted search consists of a Query which matches indexed documents and one or more FacetRequests for facets aggregation (one instance per requested root). The aggregation is done by FacetsCollector, from which you obtain a FacetResult per FacetRequest. FacetsCollector computes the top categories in three steps. First, all documents that match the query are marked in a bitset (and depends on the facet request, their scores may also be stored in memory). Then it traverses the fulltree posting, fetches the ordinals of every matching document and aggregates them in an in-memory array, where every entry holds the aggregated weight of that ordinal. After all documents have been visited and their categories aggregated, we use the children and siblings information from the taxonomy to traverse the children of the root category which was specified by the request, and compute the top categories among them. In the end, the taxonomy index is used to label the top categories. The global ordinals that are encoded in the search index allow very efficient per-segment faceting and aggregation, as all operations are done on ordinals (integers). If the ordinals were stored per-segment, i.e. the category Date/2010 would receive different ordinals in different segments, computing the top categories would need to be done on the category string, or hold some in-memory data structures that e.g. map local ordinals to global ones - that would have affected the scalability of the facets significantly. Global ordinals do have a downside though. When you want to merge two search indexes which have respective taxonomies, their ordinals need to be translated. That means that you cannot use the efficient IndexWriter.addIndexes(Directory...) API to merge the indexes, but rather the .addIndexes(IndexReader...) expensive API, in order to translate the ordinals that are encoded in the source search index, so they match the target one. The two-phase aggregation done by FacetsCollector may seem unnecessary and expensive. Mike McCandless, who has recently added faceted search to Lucene's nightly benchmark, started exploring doing the aggregation in one step, as documents are collected. The two-phase aggregation does have some strengths though. For example, it allows to compute facet weights on a sample set of the results, rather than over all documents. That is an important capability for large indexes, since the cost of doing faceted search is proportional to the number of documents that matched the query. The two-phase aggregation is also useful when you want to compute the facet weights on the complement set of the matching documents (i.e. 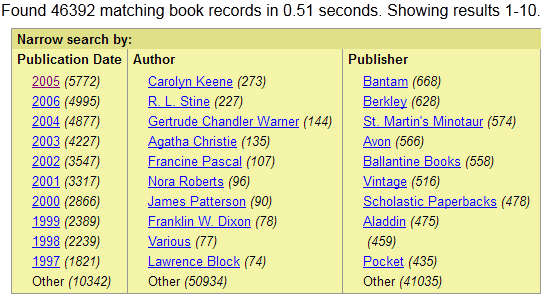 those that did not match the query). This is quite difficult to do when facets are aggregated as documents are collected. First, you can only aggregate the facets of the complement set retroactively, i.e., only after seeing docs 1 and 17 you know that docs 2-16 did not match the query. But, when out of order query matching is done, you can tell the complement set only after all documents have been collected! Second, complements aggregation is useful only when the number of results is more than 50% of the documents in the index, but that is also unknown until the query matching phase is done. Lucene facets are very powerful and they come with a multitude of extension points to help you customize and optimize them to your application needs. I'm sure that now that facets are part of the nightly benchmark, they will see a lot of improvements, both to their API and more importantly, their performance. Stay tuned for updates!